On January 06, Yusaku Maezawa orchestrated a record for the most retweeted tweet ever. 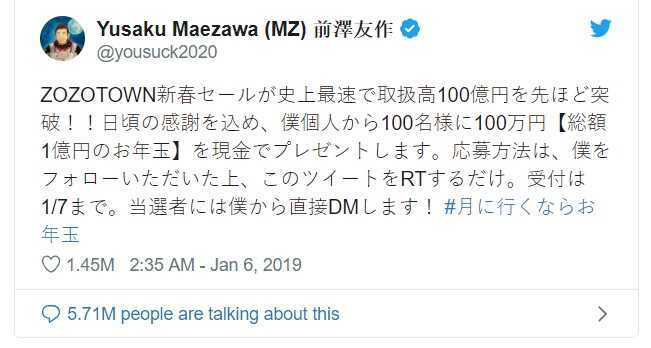 The 43-year-old tweeted in Japanese offering one million yen (NZ$13,500) to 100 randomly chosen users on the basis that they followed and retweeted him. He subsequently lived up to his offer and deposited one million yen to each of the chosen one hundred Twitter account holders. As at today he has 5.55 million Twitter followers. Early in May this year a Japanese billionaire art collector paid US$98m for seven entries at two auctions of contemporary art conducted by Christie’s and Sotheby’s in New York. Yusaku Maezawa has been financially successful as a consequence of establishing Start Today Co Ltd (e-commerce) in 1998 and online fashion retailer Zozotown in 2004. His companies made him a billionaire by his mid-30s, and at the age of 40 in 2016, Forbes magazine described him as the 17th wealthiest man in Japan. Mr Maezawa is the founder of the Contemporary Art Foundation in Tokyo which holds public exhibitions twice a year and he also plans to open a private gallery in his hometown of Chiba. He plans to put his most recent purchases on display in Tokyo. His biggest purchase in New York was $57.3m for a large work by Jean-Michel Basquiat, untitled and featuring a black devil's head. 1982. Acrylic on canvas. 239.1cm x 500.1 cm. Jean-Michel Basquiat (December 22, 1960 – August 12, 1988) was an American artist of African descent who sadly died of a heroin overdose. $13.9m. Untitled 1990 Christopher Wool painting of the word "Chameleon". Enamel and acrylic on aluminium. 243.8cm x 162.6cm. $9.7m. "Runaway Nurse" by Richard Prince. Inkjet and acrylic on canvas. 280cm x 167.6cm. $6.9m. "Lobster" by Jeff Koons. Polychromed aluminium coated steel chain. 246.4cm x 47.9cm x 94cm. $2.6m. 2012 "Self-Portrait as Vincent van Gogh" by US artist Adrian Ghenie. Oil on canvas. 48.3cm x 30.5cm. $5.8m. 1952 "Sumac 17", a mobile by sculptor Alexander Calder. Sheet metal, wire and paint. 104.8cm x 115cm x 27cm. $1.69m. 1986. A light sculpture spelling out "Eat War" by Bruce Nauman. 13.7cm x 79.4cm x 5.1cm. Number two in an edition of three.